I used the ginger sauce I made the other day for samsui chicken to cook the soup. It was mildly hot and peppery at first taste..but once you drink the soup, the heat from within builds up and warms the body. It was good on a cold rainy day. 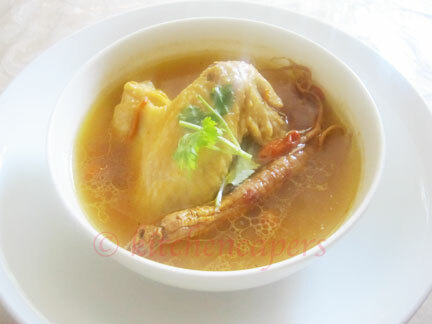 I also use the soup to cook the rice..it smells like Chicken Rice but taste of the ginger was very evident in the rice. It compliments the dish. 1. Boil water in a large pot, add ginseng, golden cordyceps, to boil. 2. Once it starts boiling, lower the chicken into the boiling water slowly. 3. Continue to boil over medium heat for 10 mins..then lower the heat. 4. Boil for another 30 minutes, add ginger sauce, wolf berries and sea salt to taste. 5. Serve hot with rice or good on its own.